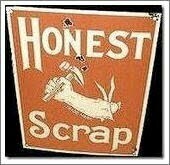 TriMommy from Going the Distance has bestowed upon me the "Honest Scrap" award. What this means, I really don't know, but I think I'm supposed to share some "honest" things to the blogosphere. Most of what I share on my blog is "honest" but occasionally some sarcasm (ok, maybe a little more than occasionally) sneaks through. So I had to think about what would qualify as "honest scrap" and decided that things that are confirmable "facts" or historical "events" don't make the cut in and of themselves. That left that I would focus on my beliefs and thoughts processes. Hope you enjoy! I believe that one of my biggest strengths is my ability to focus on long term goals. I may not be the most skilled (although I feel I'm not so bad in certain things) and it may take me a while but I'll get most stuff I put my mind to done. Adversity is something that needs to be worked through as much as possible. I'm very demanding and fairly competitive. I believe that I hold myself to high standards and I expect and hold others to those same standards. I often wonder if a lot of my injury is psychological. After all, doesn't everyone has aches and pains? I keep thinking if I'm just wimpier than most. I find it ironic that pursuing a healthier lifestyle has introduced me to more than what I consider my share of injuries. Yes, there are measurable changes (most notably in my body composition). Yes, I know this continues to be the right thing and that it will extend my life. Some doubt, of course, entered my mind when I was in the back of the ambulance after getting hit by a car while riding a few months ago. I think I rarely sleep through the night. A few years ago I was tested and diagnosed with sleep apnea. Now, since I lost weight, my wife says I no longer snore. One doctor recommended that I get tested again when I'm done losing weight to make sure it is gone. I believe my work persona is very different from private persona which is also very different from my blog persona. I tend to look more towards the future than to the past. I focus on opportunities to improve rather than on accomplishments themselves. I took a psychological test a while ago at work and was categorized as a "REFINER." Some view this as focusing on the bad rather than the good though. I have learned that "better" is often the enemy of "good enough." I don't like being a victim of anything. I believe that it is better to make a wrong decision and keep progressing towards "whatever" than to not make a decision and have it made for you. Of course, making the right decision the right way for the right reasons is often the best path. I believe that many people get caught up in too many things unnecessarily, myself included. Understanding why you are doing something or thinking of something as important often requires you to step back and revalidate goals, motives and tactics. It may be the right thing but you want to make sure you haven't lost your way and are sweating the small stuff. I generally believe I am fortunate to have a good life. There are tough parts but there are great parts too. I'm not big on bestowing these things/obligations on others but feel free to pick up the challenge without the feeling of being picked on should you find this interesting. I do find it fun to see about how people do something as open ended as this (maybe that's something else I should have added to the list). We should start a middle of the night support group. I am the same way! Be proud of your injuries...you're still so much healthier than before. Guys on couches don't get sports injuries! Have a great weekend, Rock. Interesting stuff. I was thinking about work persona vs private persona vs work persona. I think mine are all the same, but I have often wondered about the bloggers that I follow. Since I carry a mental picture of each of them, how would that hold up if I met them in person? I am going to meet one of the bloggers I follow in several weeks at the Little Red Riding Hood Bike Ride and it will be intersting to see. And I 'picture' you as gregarious, determined, competitive ans warm hearted. How does that sound? Very thoughtful and interesting list. I think in many ways I'm the diametrical opposite of you, but which one of me? Because I agree: I am totally different here, in the blogosphere, than I am at home; and I'm different again at work. I'm different yet again in other milieus. Man, maybe I have a personality disorder. But which one of me? I sometimes have problems sleeping at night too! I hate it because I feel tired alot...running helps with this. I think that it is great that you feel that you are fortunate to have a good life:)Isn't that what we all want..to feel happy about what we are doing! I think the tough parts have a purpose and help us with the good:) Great post! Enjoy the rest of your weekend!